See what room styles we have available to you. Here is a brief glimpse of the style of rooms we offer at Aabiya Lodge. Take a look at some of the imagery provided for each room and see what best suit your every need. This suite offers 2 large double beds with an en-suite bathroom with a shower and wardrobe accommodations. This suite offers Delux queen bed with a en-suite bathroom with shower and wardrobe accommodations. This suite offers a luxurious queen sized bed, a patio and a tiled en-suite bathroom with a shower. A good pick for the single traveller who is checking in alone. The room comes with a single bed, bathroom amenities, air conditioning, satellite television and full English breakfast for one. A good pick for those travellers moving in pairs. The room comes with a twin bed, bathroom amenities, air conditioning, satellite television and full English breakfast for two. Our superior rooms offer an experience for the traveller that seeks out a modern living space. 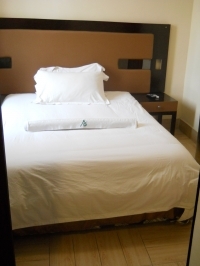 The rooms are simple yet elegant with specially designed furniture that will leave a positive impression on your mind. Bathroom amenities, full English breakfast, satellite T.V, air conditioning all come standard with the room. For those travellers looking for something more comfortable or for those travelling as a group, our deluxe double twin will surely not disappoint. It has two single beds and a kitchenette area for conjuring up light meals. For those travellers looking for something more comfortable or for those travelling as a couple, our deluxe double will surely not disappoint. It has a very spacious double bed and a kitchenette area for conjuring up light meals.